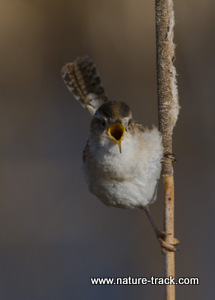 This marsh wren says “You don’t need a reason to celebrate birds,” but if you want to join in the fun of International Migratory Bird Day on May 17, unite other wildlife enthusiasts at the Ducks Unlimited Market Lake Ranch at Roberts (cross over I-15 on 800 North and you are there). I fretted about the upcoming International Migratory Bird Day this Saturday and its theme, Why Birds Matter, as I watched the swallows at Market Lake stitch the air with their aerobatic flight. Do birds really in fact matter, and if so why? I began to look at the swallows through an economist’s eye. They do consume millions of mosquitoes. Could their worth be thus boiled down to dollars and cents for insect control for the benefit of humans? I readily acknowledge that the world didn’t explode when relieved from the weight of a couple of billion passenger pigeons. Kingdoms didn’t topple when the last dodo bird was clubbed to death. And on the reverse, when reports of sightings of the presumed extinct ivory-billed woodpecker drifted in from the Arkansas woods, it didn’t even cause the stock market to twitch. So, do birds really matter? The scientist in me rises to the theme’s challenge of outlining the benefits birds bring to humans, examining them in practical, “justify their existence” terms. Fair enough. That comes from our utilitarian society where everything is weighed and measured for usefulness to everyday life. We all know that chickens provide value to humans, but wild birds do even more. Many birds are pollinators, maintaining the plant life we all depend upon. Birds disperse seeds, often great distances, again, helping to maintain the plant communities that provide their own tangible benefits to the human economy. Without birds to assist in carrion disposal, disease would run rampant as carcasses rotted on the landscape. And without birds, insects would escape the delicate natural balance and burgeon out of control. Many rodent populations would also surge ahead should raptors disappear. All of these benefits are measurable in some form, although exactly how to value them is often in question. Wild game birds provide recreation and table fare and what someone is willing to pay for that privilege is certainly one measure of value. Birdwatching also has relatively easily measureable economic impacts. Ecosystem benefits, on the otherhand, are not as easily measured as they are acknowledged. But there is the other side of me that can’t begin to put a dollar figure or value on watching an eagle soar or listening to the song of a meadowlark or enjoying the antics of a coot. Even the most practical among us will pause in their affairs of life and turn their faces skyward to search for a wedge flight of Canada geese when goose music filters down from above. That reflective side of me recognizes an intrinsic value in birds and asks, why do we have to justify birds at all? Theirs is a life form already tested and proven by the fires of time. Why should they require further justification, in terms of money? Despite what some may think, there are things that are priceless, not worthless. So on a single day in May, we celebrate one of the most fantastic natural events on the planet as millions of birds make their way to summer homes, some traveling over 20,000 miles to do so. As for the theme of the event, why birds matter, to me it has nothing to do with money.